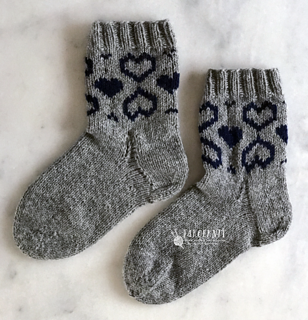 This pattern is made for both men and women, 3 sizes for women and 3 sizes for men. 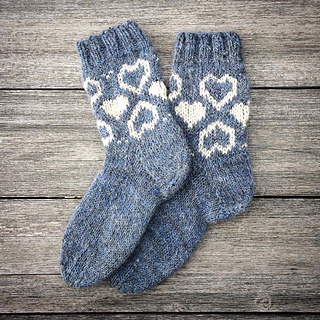 Knit these Nordic Hearts Socks as a gift for your significant other on Valentines Day <3 or as a Christmas gift. Intermediate. You have to know how to knit in the round and to knit with two colors in the same round. These socks are worked from top down. Navia Sock yarn, worsted weigh, 70% wool and 30% Nylon. 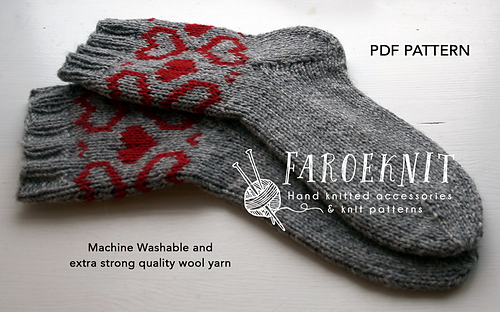 The yarn is machine washable, and extra strong, because of the Nylon. I used 2 skeins of Col. 502 and about 20 g of contrast colour. One short circular needle with a circumference of 30 cm/12 inches) and 5 double pointed needles, both size 4.5 mm (US 7), or a set of 2 circular needles in mentioned size, the second needle can be longer, for example 40 cm/16 inches. Cuff is 23 cm in circumference (9.2 inches). 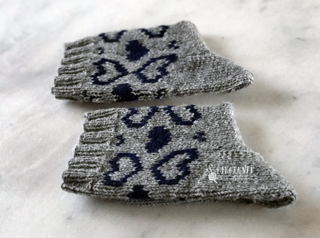 With mentioned gauge, the toe length is about 3.5 cm/1.4 inches from start of decreasing for toe to finished sock. The sock is a little stretchy. Size 36/37 (US 6 - women) 20 cm/8 inches. Size 38/39 (US 8 - women) 21,5 cm/8.6 inches. Size 40/41 ( US 10 - women) 23 cm/9.2 inches. Cuff is 25 cm in circumference (10 inches). 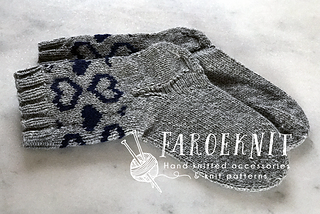 With mentioned gauge, the toe length is about 5 cm/2 inches from start of decreasing for toe to finished sock. The sock is a little stretchy. Size 42/43 (US 9.5 - men): 24 cm/9.6 inches. Size 44/45 (US 11.5 - men): 26 cm/10.4 inches. Size 46/47 (US 13 - men): 28 cm/11.2 inches. The pattern is written in US/UK language. I used both the US and the metric measurements in this pattern.